Whether you’re stepping into a Jewish deli for the first time, shopping at a kosher supermarket or going to a friend’s house for a traditional Shabbat dinner, here are some useful words to know. Many of them are also in My Jewish Learning’s pop-up dictionary, so if you encounter them in one of our articles, you’ll automatically get the definition and be able to listen to the pronunciation. We have recipes (usually more than one) for all the specific foods listed. Did we miss something? Email us your suggestions to community@myjewishlearning.com. Hungry for more? Visit The Nosher, our lively food blog! Bentsching: (Yiddish) Reciting Grace after Meals, or Birkat Hamazon. Hamotzi: (Hebrew) Blessing said over bread. On Shabbat, Hamotzi is usually said over challah. Schmear: (Yiddish) A generous spread, usually used to refer to an ample portion of cream cheese applied to a bagel. Zemirot: (Hebrew) Songs sung at the Shabbat table. Cholov Yisroel: (Hebrew, also spelled Halav Yisrael) Dairy products produced by Jewish farmers. Some ultra-Orthodox Jews will only eat kosher dairy products that are also cholov yisroel, while others eat any dairy products that are certified kosher. Fleishig: (Yiddish) Meaty, an adjective to identify foods containing meat or dishes/utensils that are used for meat. Jewish dietary laws prohibit combining meat and dairy foods. Hechsher: (Hebrew) Kosher certification for foods, and some other items, a label that identifies a product as complying with Jewish law. Kasher: (Hebrew) To make something kosher, usually referring to dishes, cookware or a kitchen. Kosher: (Hebrew) Adhering to kashrut, the traditional Jewish dietary laws. Mashgiach: (Hebrew) A kashrut supervisor, someone who ensures that a product or restaurant can be certified as kosher. Milchig: (Yiddish) Dairy, as an adjective to describe food containing dairy, or dishes used for foods containing dairy. Jewish dietary laws prohibit combining meat and dairy foods. Pareve: (Hebrew) An adjective to describe food that is neither meat nor dairy and that can be served with either. Pessadik or Pesachdik: (Yiddish) An adjective meaning kosher for Passover. Babka: A dense bread that’s swirled with chocolate or cinnamon and often topped with nuggets of cinnamon-sugar streusel. Bagel: On the off chance you’ve been living under a rock for the past 50 years and never saw a bagel, it’s a delicious boiled-then-baked roll with a hole, perfect topped with cream cheese and lox. Try these 12 recipes for using up stale bagels. Bamia: Libyan Jewish okra dish. Bialy: A bagel-like roll, but with a matted finish, no hole and almost always stuffed with cooked onions. Try a low-carb bialy here. Blintz: A thin, crepe-like pancake usually rolled up around fruit or sweet cheese. Traditionally served on Shavuot. Watch our video showing how to make them. 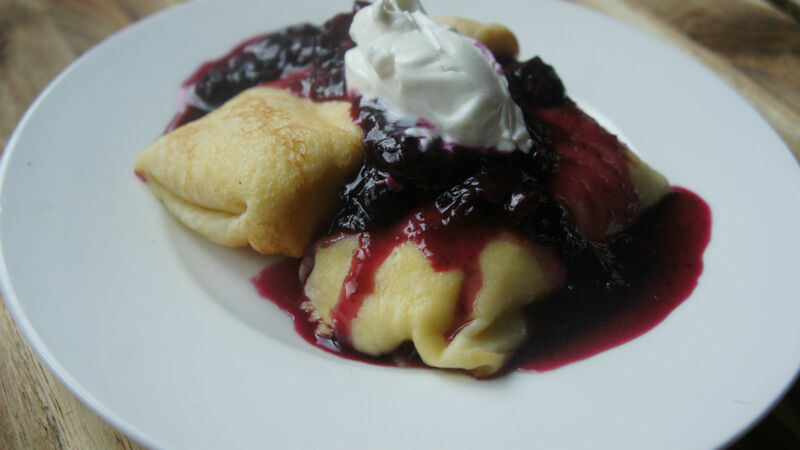 Or check out our list of 16 blintz recipes. Boureka: A savory serving-sized Middle Eastern pastry wrapped in fillo dough. Borscht: An Eastern European soup containing beets and other vegetables. There are hot and cold versions. Challah: A braided bread traditionally served on Shabbat. Find scores of challah recipes here. Cholent: A slow-cooked stew, traditionally served for Shabbat lunch. Chrain: A spicy horseradish sauce used for topping gefilte fish. Egg Cream: A sweet drink made with seltzer, chocolate syrup and milk. Falafel: Fried chickpea fritters served throughout the Middle East and considered Israel’s national dish. Learn 13 ways to eat falafel. Gefilte Fish: Ground fish mixed with matzah meal and other ingredients and rolled into balls or cylinders, which are then poached or boiled. Traditionally served on Passover and Shabbat. Halvah: A Middle Eastern candy made from tahini (sesame paste). Try these 10 halvah recipes from around the world. 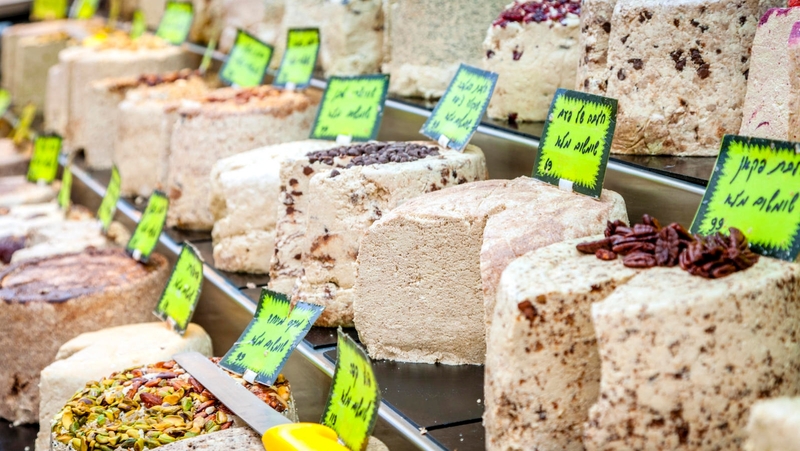 Halvah at Mahane Yehuda market in Jerusalem. Hamantaschen: Triangle-shaped cookies traditionally served on Purim. Hummus: Middle Eastern dip made of pureed chickpeas, tahini, garlic and lemon juice. This video explains how to make simple hummus. Gefilte Fish: Ground, deboned fish (usually whitefish, carp, pike and/or mullet), mixed with eggs, matzah meal, and other seasoning, which is then boiled or poached (but can also be baked). Traditionally served on Passover. Kasha: Buckwheat or groats, prepared in a pilaf and often served with bow tie noodles. Try our lightened-up version. Kichels: Bow tie pastries that are fried and often sprinkled with sugar. Kishke: A sausage-like dish, traditionally packed inside beef intestine. Kneidlach: Yiddish for matzah ball, a dumpling made of matzah meal, eggs and oil, usually served in chicken soup. Check out our many recipes for matzah balls and watch our video tutorial on how to make matzah balls. Knish: A savory serving-sized Eastern European pie frequently stuffed with potato filling. Kreplach: A triangle-shaped dumpling, usually filled with meat and served in chicken soup. Kubbeh: An Iraqi Jewish dumpling soup. Kugel: A sweet or savory baked casserole usually made with some type of starch (often noodles or potatoes), eggs and a fat. 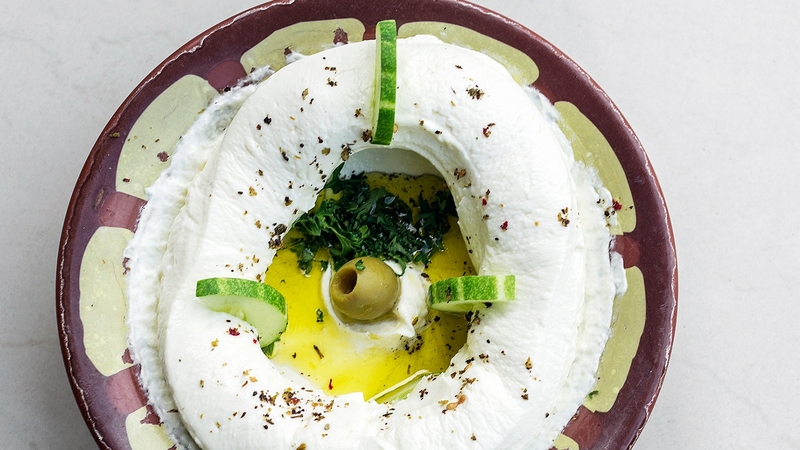 Labne: A thick yogurt-based cheese, often served with breakfast in Israel. Try this labne ice cream. Latke: A potato pancake, traditionally served on Hanukkah. We have a LOT of latke recipes to try. 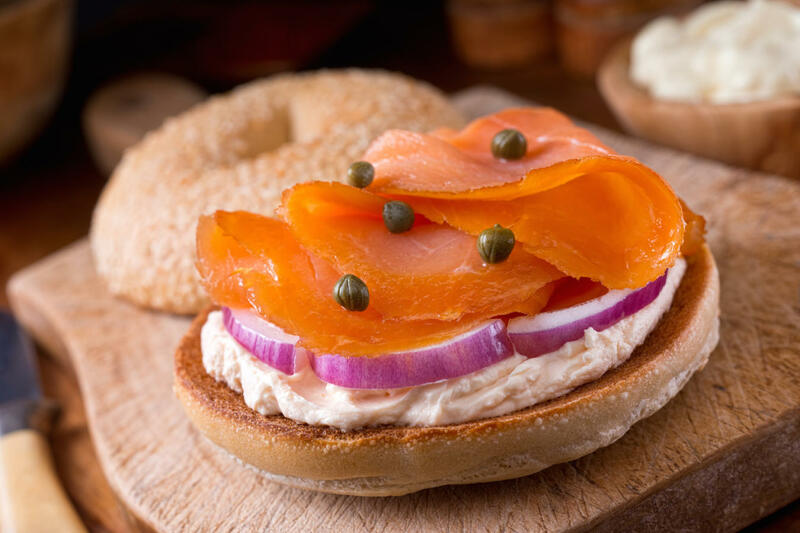 Lox: Smoked salmon, traditionally served on a bagel with cream cheese. Learn about the different kinds of lox here. 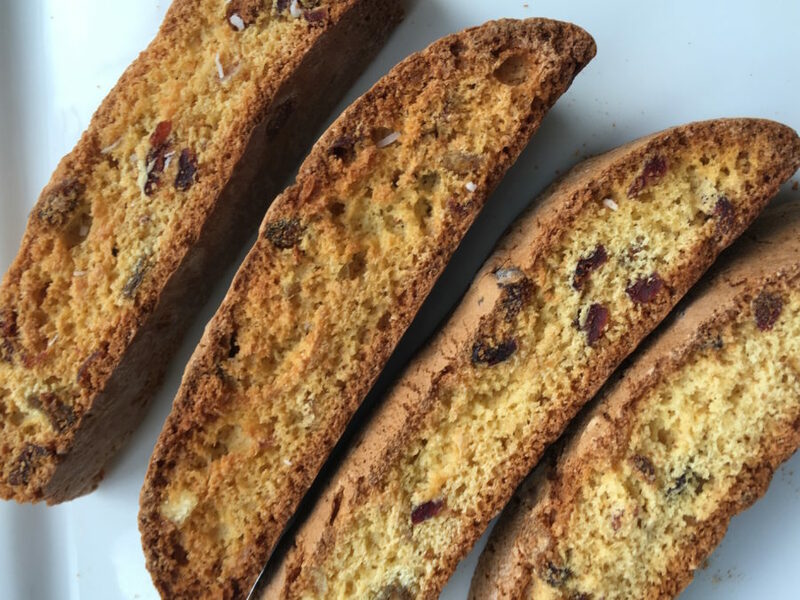 Mandelbrot or Mandel Bread: Biscotti-like cookies. Matzah: Unleavened bread traditionally eaten on Passover. Matzah Brei: A classic Passover breakfast dish of matzah and scrambled eggs, which can be served sweet or savory. Rugelach: Cookie usually made with a cream-cheese dough and twisted with cinnamon or chocolate. Our video guides you through the rugelach-making process. Sabich: An Iraqi Jewish sandwich containing fried eggplant, a hard-boiled egg, hummus and Israeli salad. Schav: A cold sorrel soup. Schmaltz: Rendered chicken (or other poultry) fat. Learn how to make it and what to do with it. Shakshuka: North African egg-and-tomato dish. Watch our video on how to make shakshuka. Shawarma (also spelled shwarma): Spiced meat grilled on a vertical spit, usually served in a pita. This is popular throughout the Middle East, often made with lamb and served with yogurt sauce; in Israel (and in kosher restaurants elsewhere), it is often made with turkey and served with tahini sauce. Tzimmes: A sweet carrot dish traditionally served on Rosh Hashanah, it often includes meat, sweet potatoes, onions and dried fruit. Pronounced: BEN-ching, Origin: Yiddish, reciting Grace after Meals, or Birkat Hamazon. Pronounced: bruh-KHAH, also BRUH-khuh, Origin: Hebrew, a blessing. Pronounced: zmee-ROTE, Origin: Hebrew, songs sung at the Shabbat table. Pronounced: HEK-sher, Origin: Hebrew, kosher certification for foods, and some other items, identifies product as complying with Jewish law.